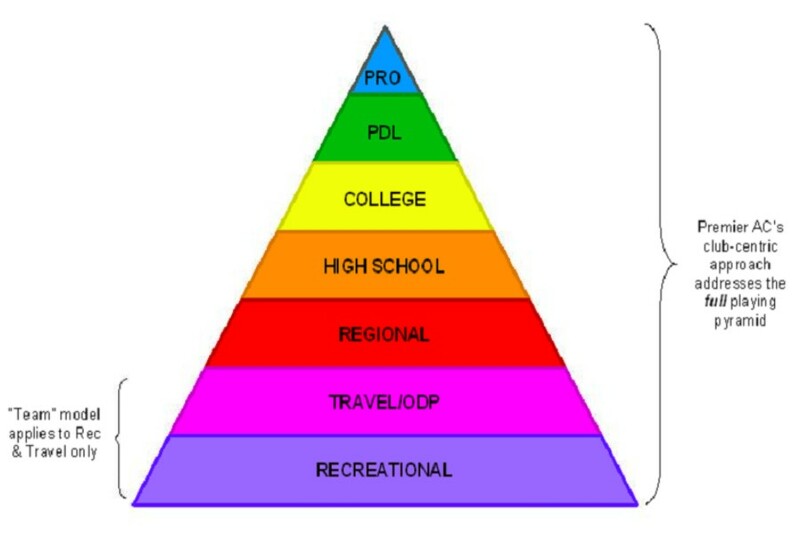 Premier Athletics Club, PAC, player development approach utilizes a proven “building block” methodology (see pyramid below). This ensures each player successfully develops the skills needed for progression from entry level through the college and professional ranks. All of our extremely committed professional coaches and volunteers bring a mix of soccer and social competencies and talents. When blended together, provides a holistic training program and support structure for our players. Our “Club Centric” TEAM, (Together Everyone Achieves More), approach, ensures that our players receive the very best soccer instruction possible through player/coach development curriculums and has a lot of fun through each of the development phases. Our club has been very successful with this “Club Centric” and “Building Block” approach as evidenced by many PAC players that have graduated to play on competitive college and professional teams.